Following yesterday’s speech of the head of the Bank of England the price GBP/USD fell to the level of 1.6523. Mark Carney said that interest rate would remain unchanged, until economic growth becomes more sustained. During American session the Pound regained losses despite announcement of the US Fed about that stimulus programs will be minimized. “Bears” did not get adequate support because this decision had been expected. 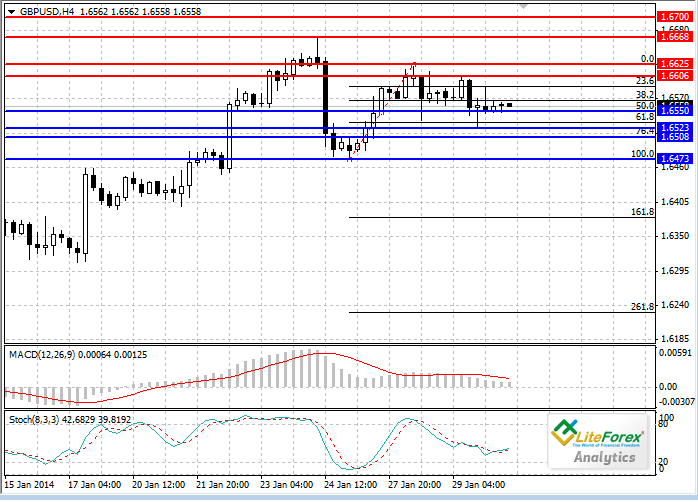 At the moment the pair consolidates slightly above the level of 1.6550. In the current situation macro-economic statistics can give impetus to a move. British data on lending volume will become known today. If positive forecast is justified, we will get another evidence of economic recovery in the country. On the other hand, the Pound is under pressure from the USD, which is strengthening its position. The decisive factor will be the data on the US GDP. On the four-hour chart indicators do not give clear signals. MACD histogram is in the positive zone and its volumes are approaching zero level. Stochastic indicator is in the middle zone; its lines are almost parallel. Resistance levels are at the local highs1.6606, 1.6625 and 1.6668. Support levels are Fibonacci lines of 50% (1.6650) and 76.4% (1.6508). In case of positive American statistics, the price of GBP/USD will be able to exceed resistance level of 1.6523. Buy positions are recommended at the level of 1.6600 with the target of 1.6668.